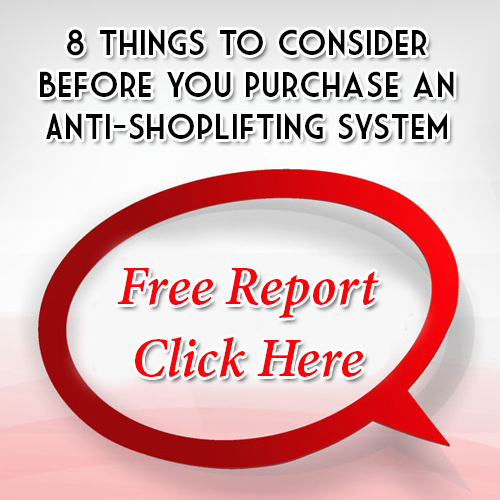 How can display merchandise be kept from being moved, tampered with, or taken from the store? Up until now, the only way that merchandise could be displayed and still have it be accessible to the customer was to use a system that used wires or cables that directly kept the products tied down. In many cases, this caused a lot of tangled wires and also presented a confusing display to the customer. Usually only one or two display items need to be secured in a specific area of the store. These items also need to be accessible by the staff to be able to move the products easily and quickly. Because more and more of these needs became evident by vendors, Alpha developed an adjustable 2 Alarm cable lock with a built in sensor to aid retailers with this specific issue. Alpha took this adjustable cable lock a step further by placing a sensor tip on the end of the cable with a micro-tamper switch with an adhesive pad. This allows the display merchandise to be protected by the cable lock and also have the sensor tip anchor to the display fixture which then allows the customer to examine the product and get a feel for it without actually removing it from the store. If by any chance the customer attempts to remove the item or cut the cable lock, the sensor will set off the 95 decibel alarm. Typically this Alpha Adjustable Cable Lock is available in 2 Alarm configurations. Another unique use for these cable locks is to utilize them by not directly anchoring it to the display platform. For example, a cordless drill with a battery can be protected by wrapping the cable lock around the handle of the drill while the sensor pad is attached to the battery. If the battery is tampered with, the sensor will alarm. These cable locks are also quite versatile in size and are available in 18 inch and 48 inch configurations. The adhesive pads and sensor tips are both replaceable and are available separately for purchase. LPSI (Loss Prevention Systems, Inc.) is known as the premier nationwide consultant around the U.S. for Checkpoint Systems and Alpha High Theft Solutions. We have nationwide sales, products, and service. LPSI provides much more than retail loss prevention equipment. Our knowledge in retail store theft prevention allows LPSI to supply valuable education and methods. Prevent theft for good with LPSI, Alpha, and Checkpoint Systems products. For additional details on Alpha 2 & 3 Alarm Products, check out our related F.A.Q. articles on our website www.LossPreventionsystems.com or call us at 1 (866) 914-2567.